For its next big release, Jim Beam is turning to that old touchstone — the Repeal of Prohibition, which celebrates its 85th anniversary this December. Jim Beam Repeal Batch is appropriately old-timey — both outside the bottle and within. Today, Jim Beam, the world’s No. 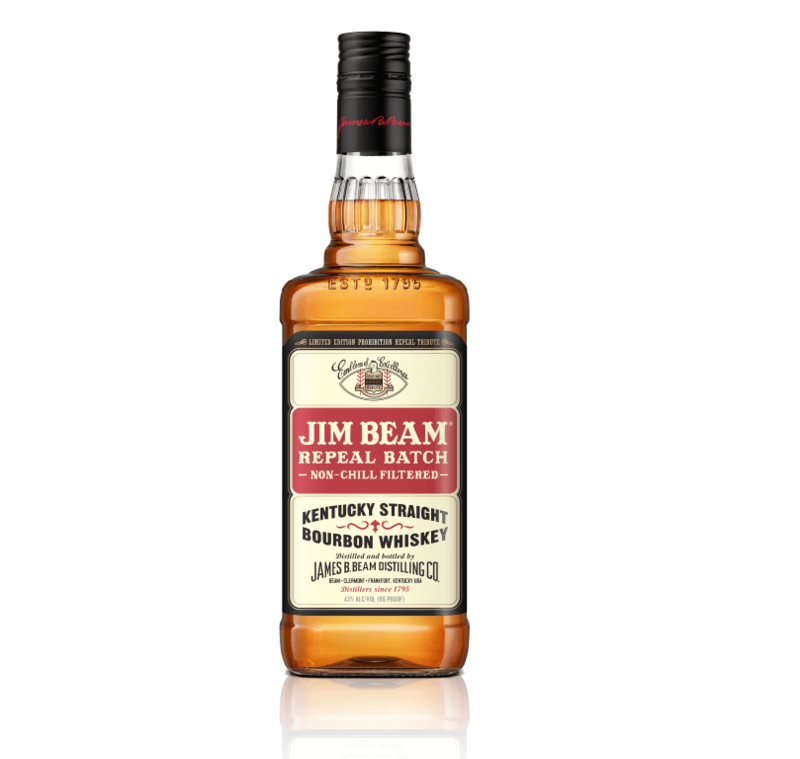 1 bourbon, is announcing the release of Jim Beam Repeal Batch, a non-chill filtered, 86-proof Kentucky Straight Bourbon Whiskey inspired by the same liquid produced by the Beam family following Prohibition’s repeal. This limited edition offering, with a label inspired by post-Prohibition Jim Beam bottlings from the 1930s, celebrates the 85th anniversary of Prohibition’s repeal and the perseverance James B. Beam put into rebuilding the Jim Beam distillery in 1933 – a feat accomplished in only 120 days. After a 13-year hiatus from the bourbon industry during Prohibition, and at nearly 70 years old, James B. Beam and his family rebuilt the distillery in Clermont by hand to get the family business up and running once again. Today, Jim Beam is the best-selling bourbon in the world. Jim Beam Repeal Batch is aged four years, similar to Jim Beam Bourbon, however this unique liquid is non-chill filtered, resulting in a bourbon with fuller mouthfeel and tasting notes that include char, oak and caramelized tones. It has a light amber color, with an aroma that carries oaky notes, balanced with light vanilla and a hint of brown spice. The key points in that: This is non-chill filtered bourbon (unlike most standard Beam offerings), and while there’s no formal age statement on the label, Beam says it’s a four year old spirit. One could assume that in the days following Prohibition, any whiskey consumed was rather young, and Jim Beam Repeal Batch certainly doesn’t dissuade that notion. The nose is youthful but fresh, with clear popcorn and peanut notes. Some of those corny notes have a charred character to them, with a slight greenness at times. There’s plenty more where that came from on the palate: Tons of popcorn and some barrel char, but the experience is mild on the whole, without much to either thrill or offend. The grainy, cereal-heavy finish is as straightforward as it is expected, and frankly a bit boring. There’s nothing wrong with young whiskey per se, but putting in a fancy bottle isn’t quite enough to get me excited about it (even at a sub-$20 price). Know Any December 5 Birthdays? Three stars it is but I prefer it to standard Beam so can I give standard Beam 2 and seven tenths stars. For $15 I gave it a go. 86 proof is a baby bonus. What’s not to like? I recommend, in my expert opinion.